The 5th International Conference dedicated to Variable Neighborhood Search (IC on VNS) will be held in Ouro Preto (Brazil), October 2017. The aim of the 5th International Conference on VNS is to allow specialists and practitioners on Variable Neighborhood Search to effectively screen papers and participate in lively debates. Professor Nenad Mladenovic is currently at Mathematical Institute, Belgrade, Serbia. He was teaching in France, United Kingdom, Canada and Belgium. He had visiting professor positions in more than dozen Universities all around the globe. He was keynote speaker on several international conferences in Russia, Brazil, Canada, Spain, Portugal, Greece, Kazakhstan, China, Serbia, etc. He is the editor in chief of one and serves as editorial member of dozen international journals. He was editor of several special issues as well. He has published more than 250 research papers and book chapters in leading OR journals, such as Management Science, Operations Research, SIAM J on Scientific Computing, Pattern Recognition, Information Sciences, Mathematical Programming, European J of Operations Research, Computers and Operations Research, OR Letters, INFORMS J on Computing, Discrete Applied Mathematics, etc. Mladenovic is highly cited researcher. He has around 14,000 citations according to Google scholar. His paper with P Hansen was selected among 30 most influential published in EJOR in 30 years history of EJOR, and ranked as 8th most cited in 40 years of EJOR. Another his paper is cited around 3,100 and around 1,800 times according to Google Scholar and Web of Knowledge, respectively. His current (H, G) – research indices are (31, 61) (Web of Knowledge) and (44, 111) (Google Scholar). 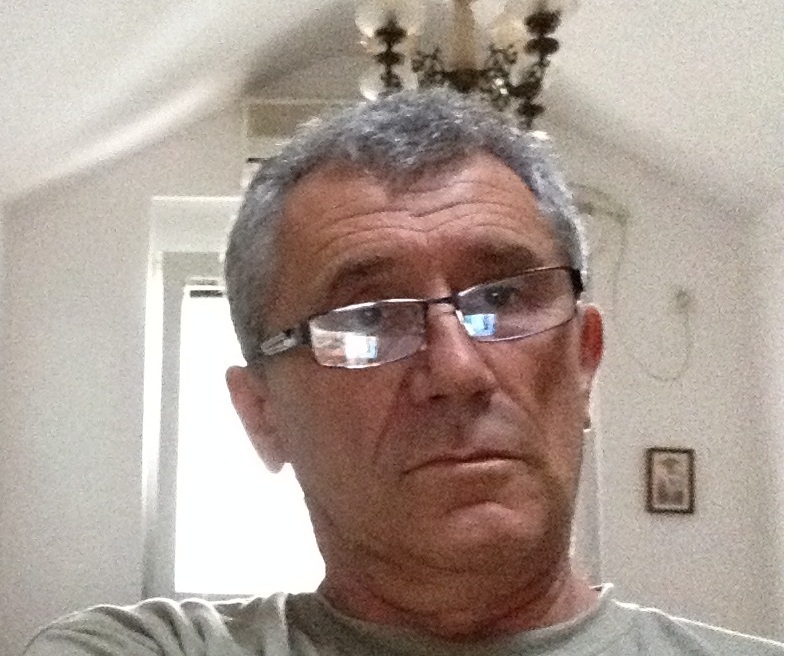 He is a member of European Academy of Sciences (Academia Europea), Academy of Nonlinear Sciences, Serbian Scientific Society, acts as a President of National (Serbian) Society of Industrial and Applied Mathematics, under his supervision more than ten doctoral students completed their PhD, etc. Dr. Christian Blum currently holds the permanent post of a Senior Research Scientist at the Artificial Intelligence Research Institute (IIIA) of the Spanish National Research Council (CSIC) in Bellaterra, Spain. Before that, from 2012 to 2016 he was an Ikerbasque Research Professor at the University of the Basque Country in San Sebastian, Spain. Dr. Blum obtained the PhD in Applied Sciences from the Free University of Brussels in 2004 and a Diploma (equivalent to a Masters Degree) in Mathematics from the University of Kaiserslautern, Germany, in 1998. His main research interests are in swarm intelligence techniques for optimization and control, and in the hybridization of metaheuristics with other techniques for optimization. During the last 15 years Christian has (co-)authored more than 140 publications in international journals, books, and peer-reviewed conference proceedings. In total, his work has currently received about 9700 citations, and his current H-index is 33 (Google Scholar). Apart from acting as area editor for the journal Computers & Operations Research (responsible for metaheuristics), he currently is also associate editor for journals such as Theoretical Computer Science, Natural Computing and Computer Science Reviews. Moreover, he is on the editorial board of several additional journals. Dr. Blum is frequently invited to give keynote talks, tutorials and seminars. He has given invited keynote talks, for exemple, at conferences such as Matheuristics 2016 (Sixth International Workshop on Model-based Metaheuristics), BeneLearn 2016 (Beligan-Dutch Conference on Machine Learning), OPTIMA 2015 (Chilenean Congress on Operations Research), and INISTA 2015 (International Symposium on Innovations in Intelligent Systems and Applications), just to name the most recent ones. Moreover, he has given invited tutorials at conferences such as META 2014 (International Conference on Metaheuristics and Nature-Inspired Computing), ICARIS 2012 (International Conference on Artificial Immune Systems), and GECCO 2011 (Genetic and Evolutionary Computation Conference). Moreover, Dr. Blum has been very active in the co-organization of scientific events. He is, for example, a co-founder of the interational workshop series on Hybrid Metaheuristics. Finally, during his carrer, Christian has won several research and supervision awards. The most prestigous award he received is the IEEE Transactions on Evolutionary Computation (IEEE TEC) Outstanding Paper Award. Concerning student supervisions, he has received an award as director of the thesis that won the first prize at the "Certamen Arquímedes" (a Spanish national competition). Registration form and payment instructions here. Nenad Mladenovic - Mathematical Institute SANU and JUPIM, Serbia. All papers accepted for presentation will be published in a special issue of Electronic Notes in Discrete Mathematics (ENDM) journal. ENDM is indexed by SCOPUS with the following indexes: SNIP: 0.389; SJR: 0.320; CiteScore: 0.350. Special issues of International Transactions in Operational Research (ITOR, Impact factor: 1.255, ISSN 1475-3995) and Yugoslav Journal of Operations Research (YUJOR, CiteScore: 0.43, SJR: 0.344, SNIP: 0.410, ISSN 0354-0243) will be dedicated to significantly extended and improved versions of the papers presented at the VNS 2017 conference. However, submission will also be open for papers which were not initially presented at the conference. A short abstract (up to half page). Accepted abstracts will appear in a short book of abstracts (without ISBN). A paper of up to eight pages prepared using ENDM LaTeX macro files (which you can download from here ). Accepted papers will appear in the Electronic Notes in Discrete Mathematics volume and their abstracts will apear in the short abstracts book. In order to include your abstract in the book of abstracts of the conference, it must be carefully checked to avoid any English mistake. Additionally, abstract length must be set to a number of words between 150 and 200. A short acknowledgement is welcome under your abstract if necessary. Finally, we encourage you to carefully review the affiliations and names of the authors. Ouro Preto is located about 100/km from the capital of Minas Gerais state, Belo Horizonte, in a region which is a cultural center with various well-known poets, musicians, and Brazilian visual artists. Due to its architecture, composed by the biggest group of Baroque works in Brazil, Ouro Preto was the first Brazilian town entitled as World Cultural Heritage by UNESCO in 1980. Born from explorer Antônio Dias’s discovery of “ouro preto” (black gold) in the Tripuí riverbed in the 17 th century, the history of the city could be conflated with Brazil’s. 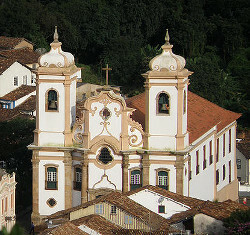 Ouro Preto enjoyed its gilded age during the Ciclo do Ouro , when it was the stage for the Inconfidência Mineira, a separatist movement led by Tiradentes and motivated by the Portuguese crown’s high taxation of gold. The decline of Ouro Preto’s mines, at the end of the 18 th Century, led much of the population to abandon the city. This migration, on the other hand, led to the preservation of its historical center, the largest example of Baroque architecture in the world. Especially noteworthy are the works of Aleijadinho and Master Ataíde. Rich in history, culture, education, and entertainment, the town has an intense cultural agenda, organized in partnership with UFOP and some of the most important artistic and cultural events of the country. Inspiration for poets and artists, for mysterious legends and stories that have persisted generation after generation among its inhabitants, Ouro Preto is an icon survived in Tomás Antônio Gonzaga’s poetry, in Guignard’s canvases and in the imagination of all who have the chance to visit. This building was completed in 1731 as a replacement for the original main church, constructed between 1700 and 1707 of mud and wood reinforcements. It is considered the pinnacle of baroque opulence and dramatic quality. Its austere facade is a sharp contrast to the lavish interior, decorated with 434 kg (956 lb) of gold and 400 kg (880 lb) of silver. Francisco Xavier de Brito, one of Aleijadinho's mentors, is believed to have designed the main altar. Don't miss the Museu de Arte Sacra in the basement of this church. Informations of other curches can be seen here. The Museum of the Inconfidência is the second most visited museum in Brazil. It is dedicated to those who died in a failed rebellion movement Inconfidência Mineira (1789) for Brazilian independence from Portugal. It offers a rich portrait of the local society at the time. 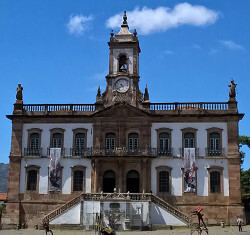 It is located at Tiradentes square, right in front of a monument dedicated to Joaquim Jose da Silva Xavier the most famous activist of the Inconfidência movement. Opened in 1704, this is oldest mine in town. This mine was dug by slaves and shows the contrast between hand dug mines and industrially dug mines. It's digging produced a maze of tunnels. 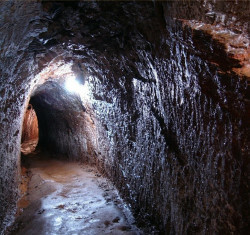 Guided visits allow tourists to explore some parts of the ancient mine. The legend says this mine was property of "Chico Rei" (fictional name), a former slave who won his freedom and become rich. He was the only black who owned a gold mine in colonial times . It is located in the backyard a particular property . The mine is well conserved. In the mine walls are cavities where the deposited gold was collected during the day. 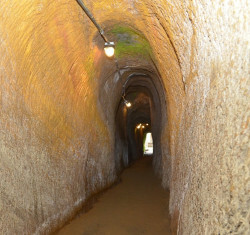 The total area of 8 square kilometers with 175 open galleries , excavated in three levels deep. 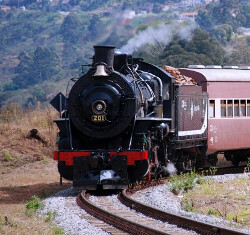 The train ride allows to know history and beautiful scenery of the cities of Ouro Preto and also the historic town of Mariana, through the old railway built in 1883, with 18 kilometers long. The carriages and the locomotive were handmade renovated, preserving its original features - keeping the same design of the old trains , with wooden interiors. Panoramic windows allow a full view of the beautiful countryside, including waterfalls. The Ouro Preto and Mariana stations complete in 2016, respectively, 128 and 102 years. 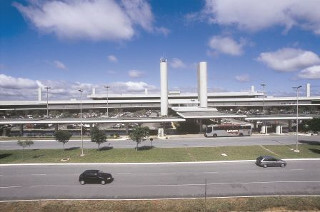 The nearest airport is the Tancredo Neves (Confins) International airport or the Pampulha airport, both located in Belo Horizonte. From these airports, a transfer takes approximately 2 hours and a half.